Competitive, but even more fun. Join the team, even with 1 or 2 players. Rental gear is awesome; gets better every year. Play year-round, especially in Texas. Always designing new courses like Castles & Ghost Towns. The Best “Team Building” events; great bonding & stories! As a 50-year-old adult, I can still play with my kids. Good exercise, adrenaline mixed w fear. This is why I’ve been promoting Paintball for 25 years. If you are a child at heart, come join the fun. 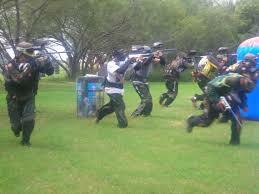 This entry was posted in Family Fun, Paintball Games and tagged birthday party, discount paintball tickets, family fun, Houston paintball, paintball fields, texas paintball fields. Bookmark the permalink.